When it comes to steelhead fishing there are few places in the world that can compare to the Oregon Coast in the Pacific Northwest. If you fish these waters you should already have a keen understanding of the effective nature of fishing beads. In this journey, we climb in the boat with one of Oregon’s top fishing Guides and new SCB pro staff member Aarron Schmidt of Schmidty’s Guide Service. Stone Cold Beads “Candy Corn” Roe – Natural stone fishing bead. 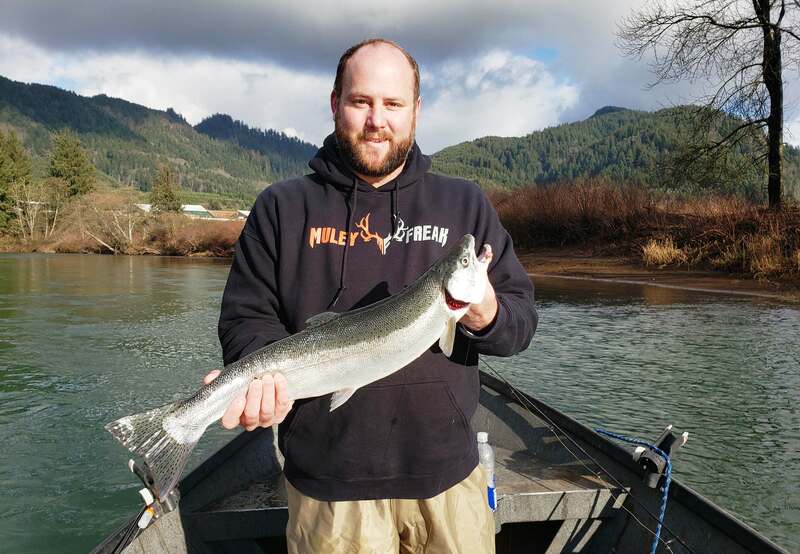 The steelhead fishing this year has been relatively slow so far but on this day the water was perfect and the sun was shining bright offering excellent visibility. The day started off a little slow, as expected with the way the season has been. There were a lot of boats that day, and everyone was throwing the same thing with little to no results. We decided to try something new from our friends at Stone Cold Beads. Since the conditions right, we were eager to try our 10mm Stone Cold Beads “Candy Corn” Roe. I had my eye on these beads since first introduced to SCB. The Candy Corn had the perfect coloration. Back then I couldn’t wait to get my hands on them and now was the time to put them to the test. It didn’t take long to figure out the when it comes to steelhead fishing these beads are deadly! At the beginning of our float, we started drifting our Candy Corn beads about 3-1/2 ft. under a bead master bobber, running 10lb. maximal ultragreen for our leader and drifting it between 1 and 2 feet from the bottom. We also applied some anise krill scent to our Candy Corn as an added attractant. It didn’t take long before we had one that just hammered our bead cocktail and the fight was on. Not for long though like most steelhead, these elusive beasts have a way of spitting the hook and unfortunately this one did before we could get it into the boat. As any steelhead anger will tell you that’s the name of the game, so you pitch it back in and keep on fishing. We started drifting our beads under a float through the hole again and whammy, bobber down, and fish on! This time it put up a heck of a fight and we thought for sure this one was coming home with us. We were able to get this rainbow bright beauty set up perfectly for the net but right before we could seal the deal, he made one last run for the tailout ending in an awe-striking somersault. As this chrome-domed beast was performing its acrobatic feats our hook came flying back at us. We took a few more cracks at it, but things started to slow down after that. We decided to work our way down river to a deeper hole. We swapped our rods set up to a ¼ oz. nightmare jig with the Candy Corn bead as a dropper, we also switch over to a straight shrimp scent to add a little flavor. This was definitely the ticket! Right as our bobber hit the “sweet spot” in the hole, it was gone. With a great hook set, the battle was on. Our rod bent in half, as the fish darted up river screaming line off the reel, this fish was fresh! Several jumps and runs later, we finally got him to the net. This time the hook was set deep, the fish literally inhaled the bead. We’re pretty impressed with the results these new Stone Cold Beads produce. We look forward to using them again on our future guided steelhead fishing trips.